Do not be surprised if your ferry doesn’t show up until an hour after it’s supposed to depart. And obviously this only compounds as the day wears on – a late ferry in the morning has a domino effect. I would recommend leaving plenty of leeway if you have, say, a flight to catch soon after. There’s nothing like the eruption of a boatload of people sprinting from the port to the train station in a desperate bid to make the last subway back to Athens for the night. I did a double take when I saw that an 8am arrival on Santorini necessitated a 1am departure from Athens. Super early or super late departures are inconvenient, to say the least. Book early to make sure the best ferry seats aren’t sold out. Perhaps like me, you get motion sick on cars, buses, and ferries (though for some reason trains never pose a problem for me). A friend recommended we take the slower Blue Star ferries as I get seasick. Bonus: they’re also the cheapest Greek ferry line. But due to my own procrastination, we ended up buying tickets for one fast and expensive ferry to Santorini, and one slow, cheap ferry back to Athens. To be honest, although the turbulence was definitely less noticeable than on the faster Hellenic Seaways ferry, I didn’t feel all that much less sick (how’s that for terrible English?) and the trip took twice as long. Indoor arcade? Multiple restaurant options? Escalator onboard? It’s all part of the package at Blue Star. 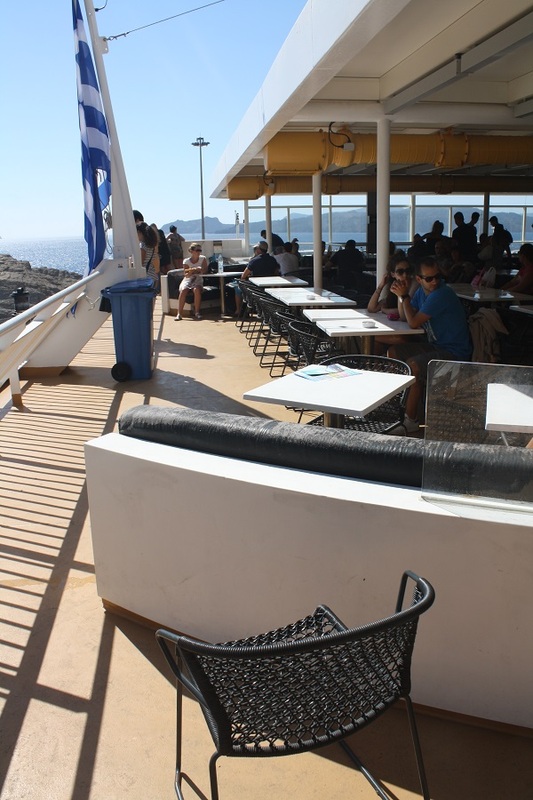 Choose from the wicker-type chairs outdoors on the deck (there are also some padded bench seats) though you’ll have to contend with the smokers, or an indoor cabin, with couches and padded chairs, little tables, power points and communal TVs. With that done and dusted, and last year’s seasickness still fresh in my memory, I can officially say long distance sea travel is not for me, even though Greek ferries far exceeded my expectations for comfort. What’s the longest ferry ride you’ve ever taken? Oh I had forgotten about the ferry rides! We did the cheap ferries many about a decade ago (oh jeez I feel old!) in college. Had to take the ferry back to Athens a day early to make sure we didn’t miss our train, and I do remember the ride being pretty long and bumpy. Though the rest of the trip had been that way as well on older trains through the Greek countryside and other even rougher terrain. But boy was it beautiful! The one from Staten Island to NYC. It seemed like it took forever! I’ve only taken the ferry from NYC to Staten Island. It was actually pretty fast and easy! Maybe we caught it on a good day? I can’t wait to take the Ferry in Greece or one in Scandinavia! I frequently get motion sickness and I have pills for it. I find that on ferries, I need to be able to see outside and fresh air also helps. The most horrific boat ride I ever had was 2 days after new years celebration. The boat was crammed with too many people, the sea was choppy, it was hot, we were all hungover and we were all below deck. It didn’t help that it was only a half hour ferry ride, but there were about 2 hours of pickups before we could get off. Worst. I haven’t been on too many ferries. I took one from New Brunswick to Prince Edward Island many years ago before they had a bridge to the island. I can’t recall how long the ride was; long enough for me to get a pasty to enjoy on board. Then there was the ferry to and from Denmark. We were on an overnight train that pulled directly onto the ferry. On the way from Berlin to Copenhagen I slept right through this part of the trip, but on the trip from Copenhagen to Paris we were still awake and went up on deck in our PJs. It was dark and very windy and cool.